Stylish, rectangular metal floor lamp has a rich, bronze finish. Add some contemporary style to your home with the Central Loft bronze floor lamp. Rectilinear metal frame features strong lines that taper to a rectangular base. Rectangular linen shade keeps the design clean and provides an even glow. Bronze finish adds a touch of softness and warmth to the design. Overall: 64 1/2" high. Shade is 16" wide x 9 1/2" deep x 11 1/2" high. Weighs 24 lbs. Base footer at the very bottom is 12" wide x 9" deep x 1 1/2" high. 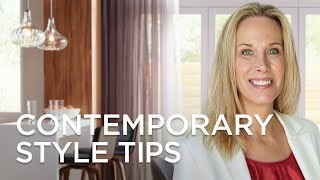 Open base, geometric design offers a great look for contemporary or even Arts and Crafts style rooms. I liked the styling of the lamp. 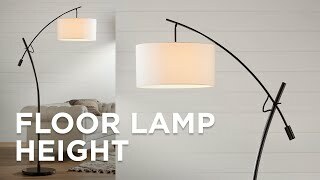 How does the lamp shade attach to the fixture? We have a lamp shade we want to use but it attaches with a finial. Is this lamp compatible with an LED bulb? BEST ANSWER: Hi, yes the light can be used with LED bulbs. Yes. And I love the lamp. BEST ANSWER: Hi, the lampshade has a light oatmeal tone/ beige to it. Textured cream colored outside and white inside. Looks crafty as the weave has some darker threads. Very happy with it. Is the base a dark bronze, almost black or a more brown/orange color? Wish I could enlarge the photo! BEST ANSWER: Hi - the bronze is a very dark brown with a black color undertone. Yes, frame is dark brown - almost black. BEST ANSWER: The base measures 9" inches X 12" inches. The base is 12” x 9”. I like the lamp a lot. Well made / heavy. Very stylish. Wish it had a three way switch and higher volt capacity but very happy with it. Good luck. What’s a socket switch ? 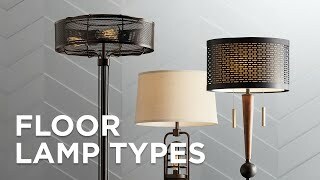 BEST ANSWER: Hi - most lamps have this. It's just a turn-switch located on the lamp socket that turns the lamp on and off. A socket switch is a switch that you manually turn on/off. There is no pull down chain. Just a basic lamp. Can I use a Hue light bulb in this lamp? 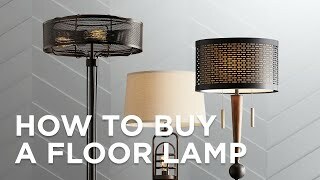 BEST ANSWER: The floor lamp is compatible with Philips Hue bulbs. The socket type is a medium base. The lamp is heavy, well constructed and gives off more than enough light. everything i needed-stylish,good color and well built. Have had this floor lamp for about a month. 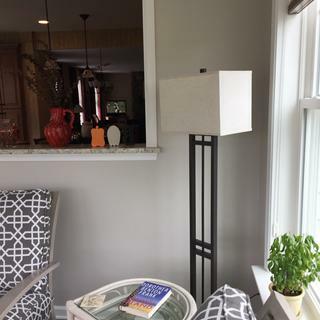 Love the contemporary style design in our new sunroom. Would love it more if it had a 3-way switch, but knew that when we bought it. Have switched on/off to remote as with the slim shade, I was concerned it would be constantly out of alignment as we turned the lamp on and off. Really nice quality. A little tough to put together, but otherwise love this lamp! great product, fits well in our living space! Very nice styling and shade. However the materials and assembling design is not great and should be much better for $229. I'd say this is worth $150 TOPS! The leveling system is thin rubber pads with adhesive to double up on bottom if need more leveling. For $229 there should be screw-in leveling legs not sticky pads. The assembly of the top section to it's bottom is very poorly done. You have to unscrew the center rod so it will stick through the bottom and take the nut on the bottom to tighten the top to the base. Now the threads show up top because the rod is actually 3/8" too short. The metal work is a bit rough for this price range and the top doesn't line up straight on the base the way they drilled the 3 holes in the base. The only reason I'm keeping it is that it is the closest match to two lamps I bought from Lamps Plus that didn't have a matching floor lamp. The table lamps are great, this one not so great. But sure looks good.